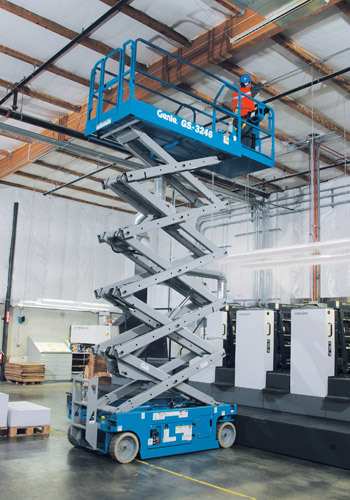 A study conducted by the St. Paul Travelers insurance company in the U.S.A. showed that most mobile elevating platform (MEWP) accidents are caused by the failure of the operator to follow simple and fundamental safety rules and precautions. The other main causes of MEWP incidents are ground conditions and overloading. We have no direct control over the rented machine’s application and use. Compliance with good safety practices is therefore the responsibility of the user and his/her operating personnel. Failure to understand and follow all safety rules could result in serious injury or death. 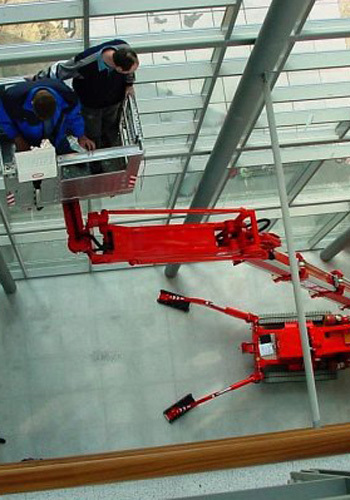 A careful operator is the best insurance against an accident and proper usage of our machines is therefore mandatory. It is the operator’s responsibility to ensure that he/she pays careful attention during the familiarisation training session given at the machine handover and immediately seeks clarity from the demonstrator on any issue not fully understood. In terms of the Occupational Health and Safety Act (OH&S Act), users must carry out their own risk assessment before using a machine. Only trained persons are permitted to operate a machine. Only operate a machine in accordance with the manufacturer’s Operating and Safety Instruction manual, a copy of which is kept on the machines. The manual should be read and fully understood by every operator, and if any doubt exists concerning any points covered, our office should be contacted. Before using any machine, carefully inspect it for damage or deformation to major components. Similarly, check the control systems for damaged hoses, cable faults, hydraulic leaks or loose electrical components covers. Damaged or faulty equipment should never be used. If in doubt, or if any problems or malfunctions are encountered, our office should be contacted. Always ensure that all warning decals, instructions, control markings and Safety Manuals are intact and clearly legible, obeyed and strictly adhered to. Do not alter, modify or disable the controls, safety devices, interlocks or any other part of the machine in any way. Before and during use of the machine, the user must check the area in which it is to be used for possible hazards such as, but not limited to, uneven ground, holes, obstructions, debris, floor and overhead obstructions, high voltage conductors, inclement wind and weather, unauthorised persons and any other possibly hazardous conditions. Never exceed the maximum safe working load (SWL), as indicated on the decals and machine serial plate. Always maintain a safe distance from electrical power lines and apparatus, allowing for platform sway, rock or sag. If in doubt, contact the appropriate authority. The machines are not electrically insulated and do not provide protection from contact with or proximity to an electrically charged conductors. Do not work within 3m of overhead electrical cables exceeding 415 volts. After entering the platform, ensure that the drop down entry bar/gate is closed. Do not wear loose clothing, dangling neckties and scarves, rings, wristwatches or other jewellery whilst operating the machines. The use of appropriate personal protective equipment (PPE) is mandatory, and a full body harness with an adjustable lanyard (used to provide work restraint and adjusted to be as short as possible) is recommended. Fasten the harness to the designated harness securing points within the platform and do not remove until leaving the platform when in the stowed position. Elevated driving must only be done on a firm level surface. Ascending or descending grades must only be done when the platform is fully lowered. Do not operate the machines on surfaces that are not capable of holding the weight of the machine including the rated load (e.g. drains, manhole covers, trenches, etc.). The machines may not be operated from a position on a truck, trailer, railway truck, floating vessel, scaffold or similar equipment. Do not use the platform to lift overhanging or bulky items that may exceed the safe working load (SWL), or carry objects that may increase the wind loading on the platform (e.g. sign boards, roof sheets, etc.). Always remain standing within the platform. Do not attempt to increase your height or reach by standing and/or climbing on the platform guardrails or any other object. Never use planks, ladders or any other device in the platform to achieve additional height or reach. Keep your feet on the platform floor. Do not sit, stand or climb on the guardrails, mid rails or boom linkage. Do not use the platform levelling system to artificially increase the outreach of the platform. Never use planks, ladders or any other device in the platform to achieve the same result. Always check below and around the platform before lowering or slewing to ensure that the area is clear of personnel and obstructions. Care should be taken when slewing out into areas where there may be passing traffic. Use barriers to control traffic flow or prevent access to the machine. When other moving equipment and vehicles are present, special precautions shall be taken to comply with safety standards established for the work place. Warnings such as, but not limited to, traffic cones, flashing lights and barricades shall be used. Horseplay and stunt driving, on or around the machines, is prohibited. The operator shall immediately report to his/her supervisor any potentially hazardous location/environment which becomes evident during operation. 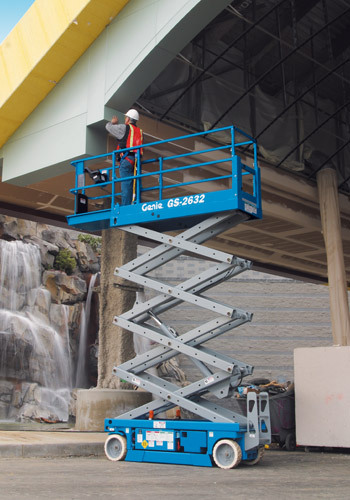 If an operator encounters any suspected machine malfunction or any hazard or potentially unsafe condition relating to the capacity, intended use or safe operation of the machine, he must immediately cease operation and report it to his/her supervisor. The operator must immediately report to his superior any problems or malfunctions of the machine which becomes evident during operation. Any problems or malfunctions that affect the safety of operation shall be repaired prior to continued use. Warning – Do not operate a potentially defective or malfunctioning machine. Ensure that any defects are corrected and repaired before operating again. The boom and platform of the machines must not be used to jack the wheels off the ground. The machines must never be used as a crane or a lifting device. The machines must not be positioned against another object to steady the platform. Care should be taken to prevent rope, electric cords and hoses from becoming entangled in the platform. Batteries must be recharged in a well-ventilated area free of flame, sparks or other hazards that may cause explosion. Highly explosive hydrogen gas is produced during the charging process. When checking electrolyte levels, great care should be taken to protect eyes, skin and clothing. Battery acid is highly corrosive and protective glasses and clothing is recommended. When the machine is not in use always stow the booms correctly. Use wheel chocks if leaving on an incline. Never leave the keys in a machine if it is to be left for any period of time. If the platform or elevating assembly becomes caught, snagged or otherwise prevented from normal motion by an adjacent structure or other obstacle such that control reversal does not free the platform, all personnel shall be safely removed from the platform before attempts are made to free the platform using ground controls. The engine must be shut down while fuel tanks are being filled. Fuelling must be done in a well ventilated area free of flame, sparks or any other hazard that may cause fire or explosion. Never start a machine if you smell petrol, liquid petroleum gas or diesel fuel as they are highly flammable. The operator must take the necessary steps to prevent unauthorised use in accordance with the manufacturer’s instruction manual. Never remove anything from the machine that may affect its stability such as, but not limited to, batteries, covers, engines, tyres or ballast. Always ensure that the owner of the machine has serviced and maintained the unit according to the manufacturer’s requirements and the OH&S Act. Never use a machine that has been tagged for repairs/maintenance. Before use each day and at the beginning of each shift the machine must be given a visual inspection and functional test including, but not limited to, operating and emergency controls, safety devices, personal protective clothing, including fall protection, air, hydraulic and fuel system leaks, cables and wiring harness, loose or missing parts, tyres and wheels, decals, warning signs, control markings, Operating and Safety Manuals, guards and guard rail systems and all other items specified by the manufacturer. Ensure that terrain and ground conditions are suitable for operation. Ensure that weather conditions are suitable for operation. Do not use the machines in winds greater than 45kph or force 6 on the Beaufort scale. Do not use the machines in electrical storms. Ensure that the machine is the correct one for the intended application. Ensure that location of operation is not in contrast to limits allowed by manufacturer when operating close to overhead electrical power lines or live electric feeds. Check that proposed travel route is clear of any obstructions, holes etc. Check and ensure the gradient of operation is allowed as per the manufacturer’s manual. Ensure that people are not in the line of operation. Check that there are no loose items on the platform itself which may fall off. Disconnect all extended cables prior to operation. Ensure the machine is clean and clear of debris. Face the direction of travel at all times. Request the assistance of a banksman/assistant as necessary. Do not leave the control station until machine comes to a complete rest. Always ensure a three point contact when entering or exiting the machine. Follow the recommended starting procedures. Always operate in slow speed when driving at height. Ensure the machine is not too heavy for the surface it will operate on. Ensure that the machine remains level at all times. Never tie the machine to any structure. Never attach yourself to any adjacent structure. Refer to the manufacturer’s manual for shut down procedures specific to the machine being used. Always check the surroundings whilst lowering the machine. Travel to a suitable parking area. Place the platform in the stowed position. Place the controls in neutral. Idle the engine, if fitted, for general cooling. Shut off engine or electrical power. Take necessary steps to prevent unauthorised use in accordance with the manufacturer’s instruction manual.